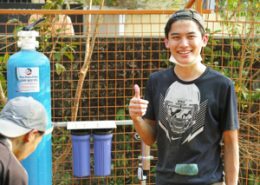 Every year, since 1998, International Volunteers of University Student Association – IVUSA of Japan has been sending groups of students to India to participate in Embracing the World’s housing projects for the homeless and for disaster refugees. These students participated in projects to build homes for tsunami refugees in both Kerala and Tamil Nadu after the 2004 Indian Ocean Tsunami. And in 2010, after devastating floods in Karnataka, they helped to build homes for people whose islands had been entirely submerged by floodwaters. Many of the volunteers have made several trips to India for this purpose. 2015 in Uttarakhand, they helped to build houses and rebuild a school for the flood-affected village. These group of student volunteers spend two weeks at a housing project. They clear building sites and help with the construction. What is most remarkable is that for many of the volunteers, the time they spend volunteering at the Embracing the World projects, long days of hard labour, is their only vacation for the year. Inspired by Amma’s own life of dedication and service, they choose to spend this time, not for their own enjoyment but to do something for the benefit of the less fortunate. With their open-heartedness and spirit of selfless service, the volunteers generate joyful interactions, much to the amusement of their Indian co-workers and local villagers. They donate their time, energy, and enthusiasm, but the volunteers often say that they receive so much more than they give. In the sharing of loving care across cultural boundaries and language barriers, the line between “giving” and “receiving” disappears, and volunteers and recipients find that they are not so different after all. In truth, they even share a common mother tongue: the universal language of Love. And in Love, you don’t feel any effort. The Japanese International Volunteers of University Student Association, IVUSA began assosiate with the Amrita Kuteeram project. Over time, volunteers from other parts of the globe have heard about the project and enthusiastically joined in. The international volunteer projects are outpourings of love and selfless service by Amma’s children from all over the world.